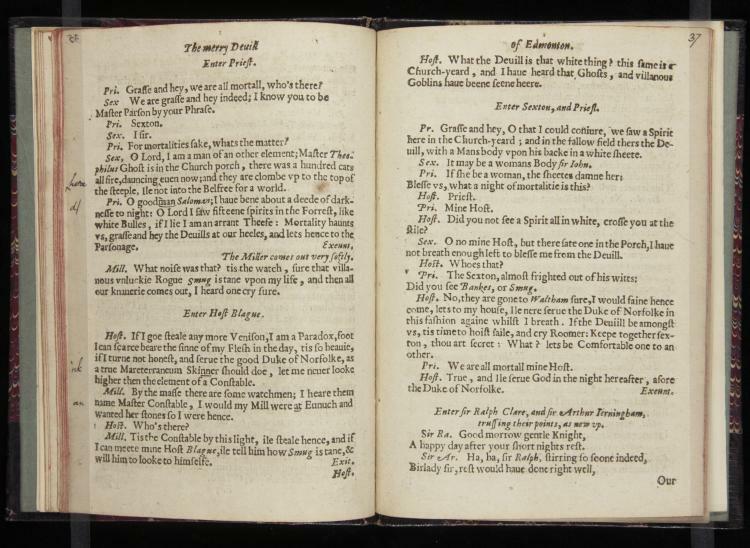 Like Mucedorus and Fair Em, The Merry Devil of Edmonton is another play that has orbited around the Shakespearean canon without ever quite being included within it. Like those plays, too, it was a play considerably popular for its time, enjoying performances throughout the late sixteenth and early seventeenth centuries, on occasion even before the highest ranking members of James I’s court, and flourishing in the printing houses; between 1608, when the first quarto of the play was printed, and 1655, well after England’s theaters had been closed down, the play was printed six times. Those printings were far from perfect. It was common practice for printers, in the name of economy, to churn out manuscripts at a rapid rate; plays were especially susceptible to such treatment, since they could not be counted on to bring in the kind of sums that bibles, say, or sermons could be counted on to bring. A consequence of this practice was that typos, mislineations, and incorrect character names made their way onto early modern pages. Can you make out what has been written? The text it borders can serve, in this case, as a guide. Beside the line “there was a hundred cats all fire, dancing even now…” towards the top of the left page, the reader of The Merry Devil wrote, between “dancing” and “even,” what looks like a small carrot signaling the corrective insertion of the word written in the margin: “here.” Just beneath this mark, the term “goodman” receives its fair measure of scrutiny, a “d” followed by a slash signifying the reader’s wish for a space to separate the adjective and the noun. And still farther below, the printer’s mistaken transformation of an “n” into a “t,” resulting in “at” instead of “an,” catches again the reader’s eye. Early modern readers may have read differently than we do now–bringing to bare, perhaps, a different relationship to language and the pleasures afforded by pouring over a contemporary play–but they did so with a level of attention that should seem familiar.